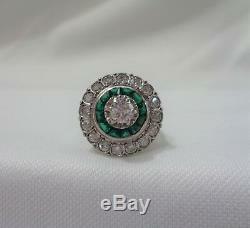 Large Antique Art Deco Emerald and Diamond Cluster Ring in Platinum. 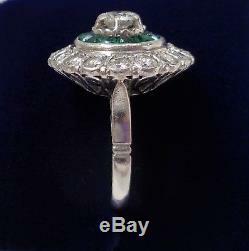 Truly spectacular art deco cluster ring set with a 0.36ct round cut diamond claw set in the centre. Calibre cut deep green emeralds frames the diamond with a further sixteen diamonds completing the final frame for a magnificent cluster! Total estimated diamond weight 1.00ct. Estimated colour J and clarity Si1 - I1. 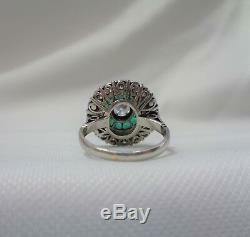 Overall design measures approx 17mm in diameter. 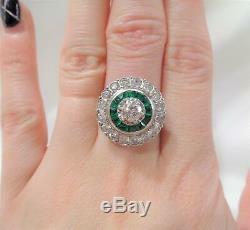 Impressive when worn you will have a lot of ring for a bargain price so do not miss! HALLMARK No hallmarks tests Platinum. Size J 1/2 (US 5). We accept bank transfer and card payments over the telephone. We post out five days a week Monday - Friday. Notification of their return must be within 48 hours of receipt. 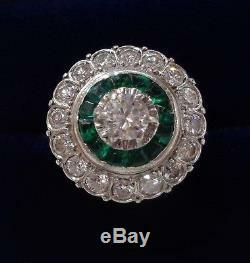 The item "Antique Art Deco Emerald and Diamond Ring Large Cluster Platinum -Size J 1/2" is in sale since Wednesday, November 14, 2018. 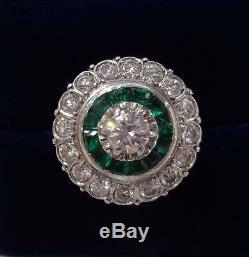 This item is in the category "Jewellery & Watches\Vintage & Antique Jewellery\Vintage Fine Jewellery\Art Deco (1915-1935)". 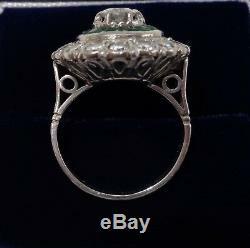 The seller is "keojewellers98" and is located in Preston, Lancashire. This item can be shipped to all countries in Europe, United States, Japan, Canada, Australia.